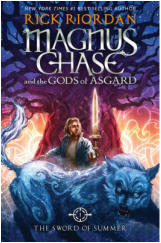 Magnus goes from being a troubled kid roaming the streets of Boston to learning that he is the son of a Norse god. The Norse gods are planning a war, and Magnus is the only one who can stop it. ​Two thirteen year old boys learn that, before being put up for adoption, they were discovered on a plane that was full of babies with no adults on board. They realize that they have uncovered a mystery involving time travel. ​A student at a secret spy school and the daughter of a former CIA operative, Cammie is sheltered from "normal teenage life" until she meets a local boy. After winning a basketball reporting contest, two 8th graders and sent to cover the Final Four tournament where they discover that a player is being blackmailed. Nick and Marta try to uncover the truth when their biology teacher disappears. Four gifted twelve-year-olds, including Logan, the candymaker's son, are set to be contestants in the Confectionary Association's national competition to determine the nation's tastiest sweet, but nobody anticipates that a friendship will form between them. After an injury ends former star pitcher Peter Friedman's athletic dreams, he concentrates on photography which leads him to a girlfriend, fame as a high school sports photographer, and a deeper relationship with his grandfather who, when he realizes he is becoming senile, gives Pete all of his professional camera gear. After being home-schooled on an isolated farm, Cap is sent to school for the first time. Will the middle school students accept this unusual boy who has never spent time with kids his own age? Her grandfather's dying words lead thirteen-year-old Theodora Tenpenny to a valuable, hidden painting she fears may be stolen, but it is her search for answers in her Greenwich Village neighborhood that brings a real treasure. All book descriptions are from the library's book catalog, Follett Destiny.